The 20-year-old reality TV star was seen holding her first daughter with boyfriend who was on February 1. Donning a patterned black jumpsuit and a pair of white sneakers, Kylie posed with Stormi who sported a cute white onesie. “angel baby is 1 month old today,” so she captioned the snaps. It’s nice to get more looks at Stormi, but fans couldn’t help but notice the gold ring on Kylie’s finger which sparked engagement rumors. However, some fans noted that it might be just a Cartier ring that the makeup mogul has been wearing. While it remains to be seen if Kylie and Travis get engaged, the latter is no doubt a proud father. Joining Kylie, the rapper also celebrated his daughter’s one month milestone on his Snapchat account. 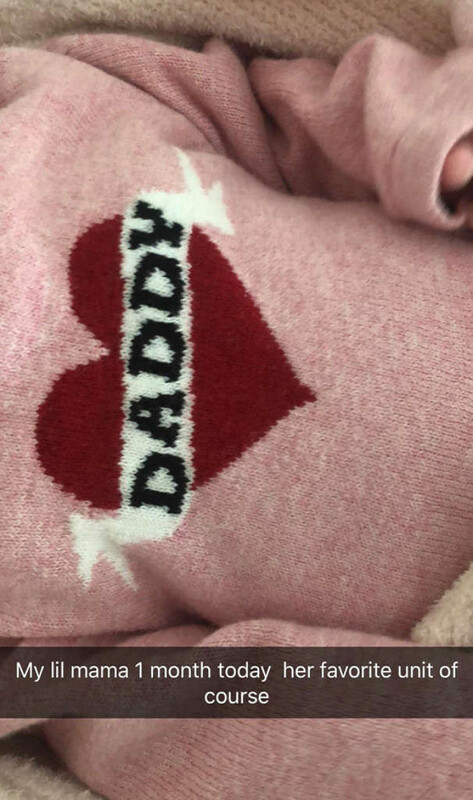 The 25-year-old rapper treated fans to a photo of Stormi wearing a pink sweater with “Daddy” written on it. “My lil mama 1 month today her favorite unit of course,” he wrote. In addition to her baby’s one month birthday, Kylie has another thing to celebrate. The “” star showed that it didn’t take much time for her to bounce back, flaunting her post-baby bod on Snapchat. Prior to sharing the adorable snaps with her daughter, Kylie posted a video selfie of herself in black underwear and color-coordinated crop top. She could be seen showing off her flat tummy despite giving birth a month ago. “1 monthhhhh,” Kylie simply captioned the video. Another photo saw the beauty sitting on a white rug. Still rocking the same outfit, the cosmetics queen was featured elegantly flipping her long black tresses.